Is your little bundle of joy ready to transform into a mythical fire-breathing beast this Halloween? Oh, and don’t worry about giving up an ounce of that cuteness, with what we have in mind, your kiddo will become even more adorable! 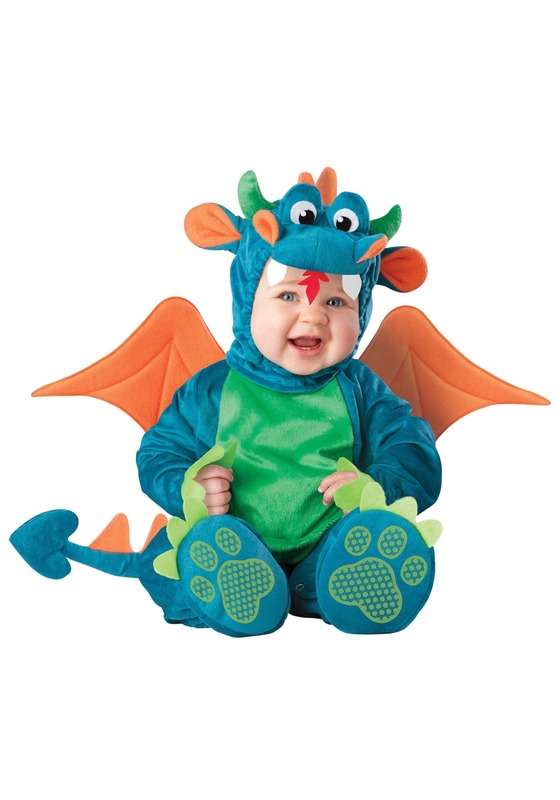 Check out this awesome Baby Plush Dragon Costume. Once your little tyke is snuggled up in this cozy velour jumpsuit, he’ll be ready for plenty of adventures. This costume is perfect for Halloween night or even just for some everyday playtime. This jumpsuit has attached wings and a tail, as well as a soft sculpted dragon head. Your youngster will look more than ready to terrorize villages, destroy castles, and kidnap princesses. Of course, if your little one is more of a happy-go-lucky dragon then he can enjoy a good ole fashion photo shoot. He’ll be more than happy to let out an adorable rawr or two for the camera! If Mommy and Daddy want to dress up as a princess and a knight, the whole family can be a fairytale come to life this Halloween! Just make sure your little dragon has control over his fire-breathing before you start going house to house, we wouldn’t want you to burn down the whole neighborhood. Give your kiddo an enchanting experience with a costume that is as adorable as a storybook drawing. The only thing cuter than this costume will be the smile on your baby’s face as he laughs and coos with happiness! Oh, and just a forewarning, while wearing this costume, your kiddo might just skip walking and go from crawling to flying. So that might be something to watch out for! It is my sons first Halloween and I planned on the theme of game of thrones. The head piece wasn’t even in the bag! That’s the most important piece! I tried calling the company and no response! This was an epic fail and I’m so disappointed. I will NEVER order from this company again! Hello! Thank you for your input on the costume. I do apologize if it arrived to you with no headpiece. In looking at your order information, it shows that you did receive it on 10/06/18, but did not contact us until 11/05, at which time we e-mailed you a pre-paid return label to send it back for a full refund. For future reference, you can always contact our customer service department, as we are very customer friendly and available through phones, chat and e-mail to attempt to quickly resolve any issues, including sending a replacement headpiece, at no charge, in plenty of time for you to receive it before Halloween. Easy to order, accurate description, excellent customer service! !